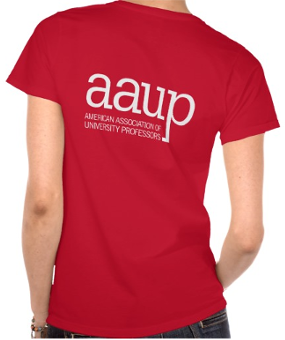 Join or renew your AAUP membership or see dues rates. Your AAUP membership gives you exclusive access to the expertise of AAUP staff, members, and leaders. Our lineup of guidebooks, toolkits, and webinars put the resources to defend academic freedom, ensure economic security, and advance faculty governance for all faculty at your fingertips. Insurance programs offer a wide variety of products to further enhance the value of your membership with extensive product offerings nationwide. Certain coverage may not be available in all states. We encourage chapters to buy AAUP T-shirts, pins, stickers, or other merchandise in bulk, which allows you to get lower prices and to buy from a union vendor. To do this, you can contact Tom McGinn at TM Promotional Marketing LLC (specify that you want union-made items) or you can work with the vendor of your choice (contact gbradley@aaup.org if you need help with this). Active AAUP chapters serve the profession on more than 500 campuses by supporting principles and programs that vitally affect the quality of higher education and professional life. Find out how you can start a chapter at your college or university.